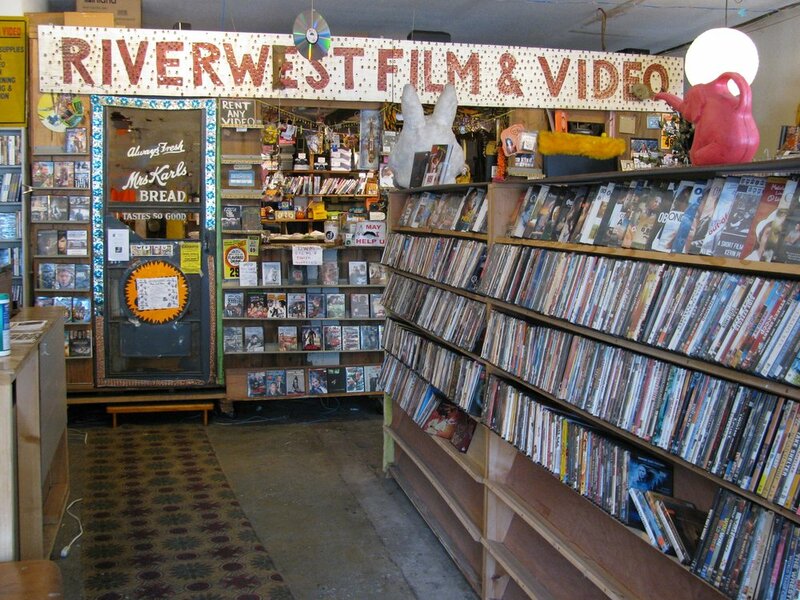 The Milwaukee-based director's documentary "Riverwest Film & Video" recently made its world premiere at the Wisconsin Film Festival. Emir Cakaroz is a Milwaukee-based filmmaker and UW-Milwaukee lecturer whose most recent documentary, Riverwest Film & Video, premiered on April 6 at the Wisconsin Film Festival. This documentary takes the viewer on a highly personal journey through an artistic community center in Milwaukee's Riverwest neighborhood, where people come to check out DVDs, host their own radio shows, buy film equipment, and chat about French empires and modern artistic movements. Cakaroz's style, which he links to Direct Cinema and cinema verite, brings us extremely close to his subjects, as the characters become comfortable around a director who establishes himself as a participant in the community. This subjectivity brings us to a non-objective kind of truth, which is specific to the moments in space and time that the director chooses to show us. I sat down with Cakaroz while he was in Madison for the festival. We discussed his style, how Wisconsin compares to his homeland in Turkey, and how his documentaries (including Revza, which screened at the 2016 Wisconsin Film Festival) challenge what we commonly think of as truth-telling. Tone Madison: How did you end up in UW-Milwaukee's Masters of Fine Arts program? Emir Cakaroz: I was looking for good non-fiction and documentary programs. I was working at a university in Turkey, with professors who had gone to school in the US. They knew which schools were good for non-fiction, and UWM was one of them. I was given a full scholarship, so that was an easy decision. After school I got married, and have been living in Milwaukee since. I moved there in 2007, so this is my 11th year. Tone Madison: How do people in Turkey view Wisconsin and Milwaukee? Emir Cakaroz: That's funny. People know the Milwaukee Bucks because people follow the NBA. And there was a Turkish player, Ersan İlyasova. People also know the Milwaukee brand drills. Other than that it's unfortunately not known very well. Tone Madison: I know you're a teacher as well as an artist. What do you hope to teach your students? Emir Cakaroz: I feel like more than teaching, I share what I know. I'm learning from students too, and this is what I like about teaching. It goes both ways. Sometimes the students know more than you. Tone Madison: Walk me through how you came to the decision to make a documentary about Riverwest Film & Video. Emir Cakaroz: The owner, Xavier Leplae, is a longtime friend. He's locally well known in the underground filmmaker world. And I was a member, always checking out DVDs. One day I met one of the characters in the film, the Rabbi, talking to the microphone on the radio. I asked him what was going on, and later on more and more people came, and it turned into an internet radio station. I decided to film the radio station from 2012 through 2105. And when I started, it was just internet based. In 2015 they got a license and became FM, though it only broadcasts out five miles. I stopped filming then, because it started to be more regulated, the space started changing, some of the characters stated to leave. Rabbi doesn't live there anymore. Tone Madison: That idea of change is interesting. The Riverwest neighborhood is often said to be going through gentrification. Was that something you were trying to capture? Emir Cakaroz: I'm not sure gentrification is the right word. When I say change, I mean that at first they had less control over the radio show. But now they have certain criteria they have to follow to have an FM station. It's not a bad thing, it's just different, on a different path from where I started. Now it would be a different documentary, and I hope someone makes it. And this radio station is only one part of the store. People live and hang out there and cook there. People would come there to talk about art and their problems. It became a community center, and it's a unique space. People from different cultures are brought together, and I haven't seen that before. It still rents DVDs for a dollar a day, which is basically nothing. They mostly make money by selling film equipment to local filmmakers, like 16mm film, which is unusual to find, especially locally. Tone Madison: One of the most intimate moments of Riverwest Film & Video is in the kitchen, when Rabbi is baking chicken and making little comments to himself. It seemed like you had him wearing a GoPro? Emir Cakaroz: Yes, that was a GoPro connected to his chest. I think it made a nice subjective point of view. It helped take me out as a filmmaker. We could see what the subject saw, and hear what the subject heard. It helped that I wasn't there. When the filmmaker is there, your subjects are acting, which is OK. But when you're not there, most likely they forget the camera is there. People can act more normal, closer to normal than when there is a big camera and lighting and a microphone. It creates that intimacy. Tone Madison: It's like the person is acting for themselves, which is what a person is doing at any given time anyway. Emir Cakaroz: I'd say it's a democratic way to record. The people are recording for themselves, and putting out their own voice. They are doing it for themselves. Tone Madison: The cooking scenes are also one of Riverwest's commonalities with Revza, the documentary about your mother. Both films had extended scenes where all you see is hands working with food. Do you want to talk about how cooking works in your films? Emir Cakaroz: For me, cooking is a relaxing moment. It's one of the most comfortable places. People become very natural when they cook. They don't act, they are focused on what they do. This is why I like it. There are rituals. Cooking has a beginning and an end. Everyone has their own style. Tone Madison: It's almost a universal thing. Especially in universities, the idea of the universal is in trouble, but it's hard to argue against the fact that everyone has to eat, almost everyone has to cook. It's what connects your mom in Istanbul to the Rabbi in Milwaukee. Would you say Istanbul and Milwaukee are very different? Emir Cakaroz: [Laughs] Oh, there is a huge difference—15 million people live very close to each other in Istanbul. My neighborhood in Milwaukee is like Istanbul in that it's very cosmopolitan, and diverse. But it's very quiet here. When I came here I had difficulties when I went out. In Istanbul you feel like people are going to crash into you. There is more space here. You don't see as many people on the streets. Tone Madison: It seems to be a part of your style that connects the two places. Emir Cakaroz: Most of the film Revza is in the house. And in Riverwest it's 95 percent inside the store. Even though one is in Istanbul and one is in Milwaukee, the city isn't important. They are both in their own private space. The shared intimacy comes from the fact of their being in a private space. With my Mom I had better access than in the video store. But being in their own area makes people more intimate. Tone Madison: Even though the public space surrounding these spaces are very different, the private spaces are connected. Emir Cakaroz: The cultures are connected, but also when people are in their home, they begin to behave similarly. They start to talk about their lives and what they think about their futures. Tone Madison: You've talked before about the balance of power you establish with your subjects. You certainly place yourself on the subjective side of the spectrum of objectivity. I'm wondering what you gain from that, and what you give up with this subjective portrayal. Emir Cakaroz: I don't think I'm looking for objectivity. That's something I never think about. This is my film, and this is my world. Even though it's someone else's store, it's through my point of view, so why hide myself? Why not show people the process? I'm not afraid to put myself in the film. It just comes up like that. When someone talks to me I talk to them. I don't say, "Don't talk to me, don't act." I am becoming part of the reality. I don't think I'm losing anything, but I'm gaining a lot by being my own subject. People come to see the filmmaker the way they see the subjects, and the more they know the filmmaker, the more they know the film. The audience sees this guy from Turkey, who maybe lives in Riverwest, and they know this film is from his point of view. Tone Madison: Maybe loss isn't the right word, but do you think there's a tradeoff? I mean, in the way documentary making is related to journalism, and how they are supposed to relate the world as it is. Emir Cakaroz: I don't know if I agree. They are certainly connected. Journalism to me is dealing with the facts. You give them a where and when, and specific factual information, which you have to be up front about. But if we consider the documentary to be art, then the filmmaker has to be a part of it. This is how we can separate it from journalism. There are journalistic documentaries, for sure. But I think the documentary brings it to an art form when the filmmaker is integrating his or her own part of view. I'm not talking about propaganda films, I'm talking about my own process when I talk about showing yourself to the audience. I'm not even necessarily pushing it. Michael Moore is always in front of the camera, trying to be a film star. Or Morgan Spurlock from Super Size Me. These guys are stars and the film revolves around them. My films don't revolve around me. I'm not necessarily leading the film. I just put myself into the flow of the film. If someone talks to me, I talk to them. If someone asks me a question, I answer. Tone Madison: I'd agree. I think your work, though we'd formally call it a documentary, is seperate from news and lots of what people watch that we call documentaries. Even with those propaganda documentaries, and even with what people agree is factual, stuff like Forensic Files, a point of view comes across. We think of those as journalistic, but they still insert a filmmaker. Emir Cakaroz: They are very popular, and the cuts are fast. I find much more honesty in reality shows. I don't necessarily like reality TV, but style-wise I find myself closer to that. I like to linger, with long takes. You don't see that in many films, where there has to be quick cuts and there's always music. These genres are always keeping people on edge, and looking for a result. They build a climax towards an end. I don't build towards what's going to happen. I show what's happening. I don't have the concern for showing a typical narrative structure. Of course there are moments where you could point to a climax, but my structure is much looser than the films you're talking about. Tone Madison: Do you want to talk about the documentaries that have inspired you? Emir Cakaroz: I really like 1960s moments in the US and France. The Direct Cinema movement, like Albert Maysles and cinema verite, directors like Jean Rouch and Edgar Morin, who made Chronicle Of A Summer. These films are very in these two countries are inspiring for me. Style-wise, especially the American cinema has affected me. Movies like Grey Gardens are my favorite films. Sometimes people don't separate these moments, but when you go deeper they are different. In the American cinema you don't see the director as much, it becomes what we call "Fly on the wall." In cinema verite, the filmmakers become a fly in the soup. They become part of the subject, like what I do. But I also like the observational aspect of the Americans. I try to combine these two approaches. Tone Madison: What artworks outside of film inspire you? Emir Cakaroz: I like Junot Diaz. I'd say he's my favorite American author. His writing is close to my practice, and he writes based on his own experience. I find him very challenging and very fun to read. I read many Turkish books. I like the Turkish poets Yaşar Kemal, Nâzım Hikmet and Orhan Veli Kanik. I listen to a lot of Turkish folk music. I'm still connected to my roots. I came here at 26, so it's hard to change your taste. You still look for what you're used to. Reid is a writer, a graduate of the University of Wisconsin-Madison, and a member of Madison Community Cooperative. His poetry has been published by Seafoam Mag, and his fiction appears in Placeholder Magazine. Reid is also a frequent contributor to local publications and is currently writing a novel about a goose in the Garden of Eden, among other more reasonable projects. When he’s not writing, he’s anxious and confused.